Snow – We Can’t Escape It! Snow, we can't escape it! ©Bert Gildart: Try as we might, it seems impossible to escape winter (see-1; see-2). At the moment, we’re attending a writer’s conference, specifically, the Northwest Outdoor Writer’s Association, an affiliate of the Outdoor Writer’s Association of America. This year, our chapter has convened at Seeley Lake, a beautiful and remote lake located in Montana — and south of our home near Bigfork by about 70 miles. Though last week it was sunny with real hints of summer, this week (and this is not unheard of for late April early May in Big Sky Country) the weather man says we will have snow. And behold, we now have it! Though we have not been hit too badly at these lower lake elevations, in the higher elevations, clouds dumped 12 to 18 inches of the white stuff, most notably in Glacier National Park and on Marias Pass, which really saw the return of winter. From what the weather man says, we can expect this type of weather to persist for the next three to four days, the duration, in other words, of our conference. Though most everyone is staying at the Double Arrow, a beautiful lodge that has offered our group discounted rates, we have never-the-less chosen to camp at Tamaracks Resort Campground, which is also beautiful and certainly much cheaper, an important consideration for us after just putting out a considerable sum for repair of our transmission. 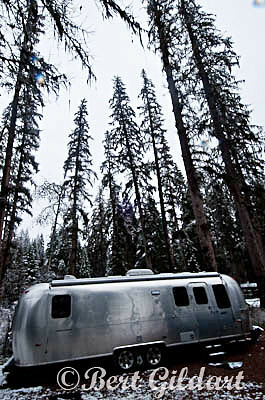 But even if finances had not been a concern, we’ve gotten to the point where we simply prefer our Airstream to commercial accommodations, despite the beauty that Double Arrow also offers. Right now, the deer are munching on willows just outside the window of our camper, and last night we drifted to sleep to the garbled wail of loons. We’ll take what we get and enjoy what we get. That not too hard to do as most of our time will be spent renewing friends with NOWA’s interesting members and attending the seminars, which are always beneficial. This entry was posted on Saturday, May 1st, 2010 at 6:30 am and is filed under Montana Photography, RV Travel, Travel. You can follow any responses to this entry through the RSS 2.0 feed. You can leave a response, or trackback from your own site.